We are the only aerial advertising agency you need, offering a comprehensive range of services for brands on a local, regional, and national scale. Our complete package options tie your brand to customers on the ground through PR coverage, social media and on-ground experiential activation. 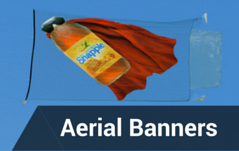 Own the sky with aerial sponsorships. Can you name a time when there was a banner flying overhead that didn’t make you stop and look up? Expand your reach and attract customers from your target market with airplane advertising services and banners — perfect for the beach, major sporting events, music festivals and spring break. Van Wagner Aerial Media is the most advanced airplane advertising agency in the industry, capable of creating the largest, most vibrant, and fully-customizable ads with logos, colors, visuals and more. Our proprietary wrinkle-reducing technology ensures that everyone in the crowd below will be able to read your aerial ad with ease. Let your message linger and simmer in the minds of a captive audience by selecting a flying helicopter sign. We’ll take a slow cruise around your audience and ensure you stand out. And don’t forget the stunts! Van Wagner Aerial Media has a proud history of providing helicopter talent for advertising stunts including TV shows, action movies, and extreme sports. Get your audience’s adrenaline pumping and create an exciting statement for your brand! Are you ready to make an eye-popping statement with sky writing/ sky typing? This highly visual form of guerilla marketing captivates people from beginning to end. Our expertly trained team of sky writing pilots will ensure your message is delivered with precision. With sky typing and aerial advertising, you can get high ad recall rates and impressions on the ground from 15 to 20 miles away. When you work with Van Wagner Aerial Media, you’ll get your brand in front of an entire market with just one ad. Our marketing experts will help you find the perfect time to perform sky writing for your audience, ask us how to create the most buzz with your sky writing campaign. Hot air balloons aren’t just for adventure-seekers — they make the perfect campaign kickoff, too! 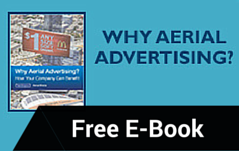 Join the ranks of many Fortune 500 companies who turn to the skies when they advertise. Van Wagner Aerial Media’s hot air balloon campaigns have a history of reaching costumers on the ground and getting coverage in local news. It is the perfect form of PR to get people talking about your brand. Why Should You Make Van Wagner Your Aerial Advertising Company? 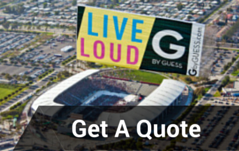 We are backed by parent company Van Wagner Group LLC and come equipped with 40+ years of expertise in the outdoor advertising and sports marketing arenas. As a full-service aerial and airplane advertising company, Van Wagner Aerial Media offers unparalleled advertising in the sky. Our experts can help you find the right plan to reach a national audience with some of the biggest and best banners around. We can integrate with your next ad campaign and help keep your name in the headlines across multiple channels.